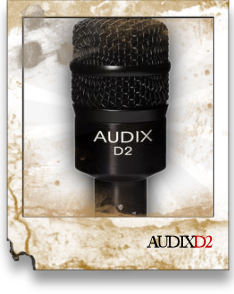 Designed, machined, assembled and tested by Audix in the USA, the D2 is a dynamic instrument microphone used for stage, studio and broadcast applications. The D2 is characterized with a hypercardioid pickup pattern for isolation and feedback control and is equipped with a VLM™ (Very Low Mass) diaphragm for natural, accurate sound reproduction. The D2 is lightweight, compact and easy to position. With a wide frequency response of 80 Hz - 18 kHz and the ability to handle sound pressure levels in excess of 144 dB, the D2 is an excellent choice for miking instruments with a percussive nature such as rack toms, congas, saxophone, guitar cabinets and brass.